I had some business at Pace HQ and noted that there is a "Your Speed" display in the parking lot. Vanpool operators using it as a racetrack? Some guy was talking about #318 not having service for 3 hours this afternoon, no 4,5 or 6 service eb. I was on North ave and come to think of it I didn't see no eb bus either in the hour I was on it, around 6. Probably no one showed up for the runs, service was scarce for Pace today, they are on holiday/Sunday service. Depends where he was looking. There was supposed to be hourly service from about :37 from Walmart, but buses starting at 9:37 a.m through 6:37 p.m. become 311 (Oak Park Ave.) instead of to Forest Park. Schedule. Again brings up the point made in 2009 that running Sunday schedule on Friday and Saturday schedule on Saturday doesn't make sense to the riding public. He just said 4:40, 5:40 and 6:40 were missing. I guess you can track where he was on the route at that time based on the schedule. He was already on my #90 so, he must have rode something else. #309 runs on Sunday? Since you said he was on the 90, apparently he thought 318 was running on Harlem, when it was running on Oak Park Ave. If you are implying that he used a different route than 318 to get to Harlem, 309 runs on Sunday schedule, and does go by Wolf and North. 6391 (river equipment) on 606 this afternoon. Before the foam starts, it's linked with the 610 at Rosemont. Daily Herald: Fox Valley, Hawthorn malls among those sold by Westfield. 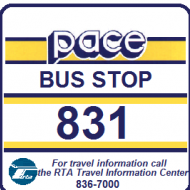 Looks like Pace will have to change at least a couple of destination signs. I wish they'd change all the signs & remove the Westfield name. No one here goes to Westfield, they go Old Orchard, Hawthorn, etc. Also, they aren't mutually exclusive. I wonder if Westfield paid Pace. I can't foam if I'm just now seeing it. But I would be interested what time that run was/is. we're going to do the Niles Free Bus modernization...no it will wait until after Pulse...it will be in Sept. 2015...no it didn't happen. Something's going to have to happen as far as storage. With all the new MCI's slated for the nw express corridor, those will have to be garaged somewhere. Niles free bus modernization?? It's not modern enough with the eldorkos? As I am sure you knew,that was the euphemism for the route restructuring. The person I noted above was supposed to live on Route 413, no 410, but is on 411. I don't know if this was already said, but is Pace rewording the signage for the West side routes? I saw route 331 one day and instead of the sign saying "331 CUMBLD/5TH" -> " 331 BROOKFIELD" -> (BLINK), it instead said a solid "331 BROOKFLD VH". I also saw route 303 and instead of it saying "303 FORPK-ROSEMNT" -> "303 ROSEMNT CTA" -> (blink), it was just a solid "303 ROSEMNT CTA". EDIT: Never mind I saw the thread that explains it. Also, why do west side Pace buses have blinking LED signs as opposed to other divisions? Someone mentioned something like that in connection with the West Cook restructuring. If I am reading you correctly, West is doing away with the first reading for the route name. If it is, it is becoming consistent with most, but not all of NW, NS, and SW division routes, which haven't had route names on the signs from way back. 303 ROSEMNT CTA is consistent with 223 ROSEMNT CTA or 606 ROSEMNT CTA, for instance. NW isn't totally consistent, for instance it has 290 Central to Fargo Loop (one sign two lines) and 290 Touhy to (flip) Overhill, even though both are 290 Touhy buses. with the route number centered, and 3 different signs. So, I guess the people on the west side will have to see if signs such as "307 Harlem" disappear. 319 won't because they need "via Grand" and "via Belmont." When NS signs were messed up (about 2005) I wrote Pace about it. Asides from having the Transitmaster programming straightened out, they wrote me that the signs would be standardized, but that only resulted at West in what you described as "before." Again, I'm not sure what you mean by that. Do you mean that they go blank between cycles? That seems to make more sense than something in NW like 250 O'Hare Kiss and Fly-->250 Des Plaines, which doesn't seem in order. Also, somehow Pace abolished the word "via" in NW and NS, while it is still good in N.
Thus, the blank makes sense, but also results in the sign momentarily not indicating anything. Finally, I prefer the CTA system of always having the route name. Me too, but it only works for CTA because many routes are associated with a single street or location ("90 Harlem", "147 Outer Drive Exp"). Pace routes tend to make more turns, so displaying the final destination works best. An example of a poor sign reading is 832 JOLIET (flip) 832 ORLAND SQ (flip) 832 JOLIET CTR. If the bus is coming from Orland Square, displaying ORLAND SQ as a "destination" doesn't make much sense to the average rider, plus "JOLIET" and "JOLIET CTR" are redundant. This route is a good case to only display the final destination (832 JOLIET or 832 ORLAND SQ). I was noticing on pace #290, the bus calls out all the stops now, not just the major intersections. When did that start? The #606 for instance still just calls out the major intersections afaik. This makes me wonder if it's something special because #290 is a posted stops only route, I believe. I think Pace could do more with associating routes and street names. For instance, 303 could have been Madison/19th/25th or 422 could have been Lake/Shermer. In fact 422 got messed up because the old 422 Lake Ave > 422 Old Orchard and 422 Lake Ave > Linden CTA re still there (presumably for short trips) while the more incomprehensible 422 Old Orchard > 422 Glenview > 422 Northbrk Ct is used for the full line. Of course, if they took my suggestion, the short trips would never make it to Shermer. CTA sort of has the destination equals route name problem for such as 157 Streeterville or 10 Museum of Science and Industry. This route is a good case to only display the final destination (832 JOLIET or 832 ORLAND SQ). Yes, the letters were all spread out. My final beef is that since Pace buses no longer have 15 character signs, why does it still truncate the words like they still do? Maybe because 290 was most recent to become Posted Stops Only, or this is something new/experimental. 364 is posted stops only, but only announced major stops last time I was on it. I'll have to see if that's changed. This also has me wondering about the new 550. Did it say "now approaching" like a typical Pace announcement, or just the street name like CTA? I caught 305 still displaying Morton College destination. Another goof is they haven't even posted 327 on the bus stop sign at Forest Park Blue Line. 303 310 and 317 don't even operate on Des Planes Ave going westbound. They go around the hill (by the parking lot) to the shortcut by the SOO Line Railroad tracks and then turn left onto Madison Street in River Forest by the railroad crossing. 303 310 and 317 don't even operate on Des Planes Ave going westbound. They go around the hill (by the parking lot) to the shortcut by the SOO Line Railroad tracks and then turn left onto Madison Street in River Forest by the railroad crossing. Looking at the maps on pacebus.com, that's the new permanent routing which applies to eastbound buses too. The intent is probably to avoid the railroad crossing and waiting for red lights on Des Plaines Ave.
That's correct but there hasn't been any trains passing through that line consistently for multiple years now. Now avoiding red lights on Des Planes indeed makes sense because it's terrible during rush hours despite the major construction (now completed) between Madison/Des Planes and the railroad crossing. However, it did bring up a lot of confusion and somewhat controversy.